History: The chapter was chartered in 1895 as the CDA’s second chapter. Its most notable project has been the operation of a Federal-style house built by Henry Pratt in 1800 as a museum for almost sixty years. 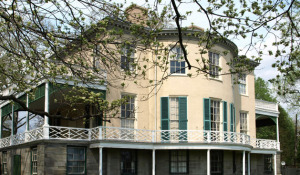 Historic Preservation: The chapter operated the Lemon Hill Mansion in Philadelphia as a house museum from 1957-2016, including providing for the house director and all expenses, and offering educational tours. Learn more about the history of Lemon Hill and the Friends of Lemon Hill group.